Four of Cups (R) says results are happening, people are hearing you – allow yourself to “feel” when a new relationship is possible. Awaken to the world and all its possibilities – always expect that there will be a positive change and stop worrying. New opportunities will now be offered – new relationships and new ideas. Trust and believe that your ideas are good and have a little more patience. Believe in yourself and when it “appears” nothing is happening, always prepare your mind for an exciting turn of events. You will experience enthusiasm – seize this opportunity. You will experience the balance of feeling internally satisfied and fulfilled as well as external emotional fulfillment. See what happens as a built-in opportunity to re-direct your angry energy. Recognize that you can be volatile and dangerous. Choose not to hurt others or tear down your creations in a moment of anger – use this energy to move forward toward your goals. Can be in the nature of a “chance of a lifetime” opportunity. How do you feel dissatisfied? Where do you go to find peace and serenity? How is this time of withdrawal and contemplation benefiting you? What are you re-evaluating in your life and relationships? What are you fantasizing about and what can you do to realize your fantasies? Next to Wheel of Fortune: There will be a new interest – you should become involved, it will eliminate your present dilemma. 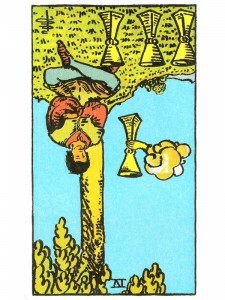 Next to Hanged Man: You are feeling sorry for yourself, get over it – no one likes miserable company. Make some effort. Next to Hermit: Allow yourself to enjoy this spiritual refreshment – a gentle peace and satisfaction surround you. In the first position: While there are many distortions, there will be one that is dominant. Look for the characteristic in this reading that “jumps” out at you. In the second position: Too much stability tends to turn you inward and at the extremes be dominated by fears of something happening to change it all. Too little stability drains you of energy and assets you need in the Physical/material plane, ranging from you own health to your business. In the third position: Imbalance of the emotional/creative foundation. There could be a shake up in your inner circle of family/friends. The problem could well be within you however. Review the general meanings, letting the cards speak and amplify the central message. In the fourth position: Your passion may be more toward the extremes of this card, in a desire for too much or too little emotional stability. We cannot succeed wanting to be totally captive or totally free. And we cannot be happy wanting more or less than the share our soul requires. The misplaced passions possible here are numerous, but a few of the most frequent ones are: dominance/control, submissiveness with a hoped for protector over you. The need to be liked too dominant or missed altogether. In the fifth position: Your excess of emotional/creative control or the lack of it, may be causing parallel difficulties in your mental affairs. Lack of confidence here is at the root of all the possible culprits which include; jealousy/possessiveness, mental abuse and infidelity. In the sixth position: Neither be too serene, nor too restless. This archetype is yours for the having in the near future if you can withstand the test of one or more of the distortions, the nest of the worms (jealousy, vanity, etc.) Remember, no one can stop you from loving yourself or from loving others. In the seventh position: On the one hand, do not be lulled into mental complacency because your emotional house is so comfortable. On the other hand, if it isn’t all that comfortable, do not use that as an excuse to falter in your mental obligations. Be neither submissive, nor dominant and yet be both. In the eighth position: On the one hand, you may be missing an opportunity if you do not become more aware. On the other hand, you should not pretend to see an opportunity where there is none. The discipline here may have become physical abuse. In the ninth position: Your subconscious may be distorting this archetype. A major purpose of this reading will be to bring these unhealthy extremes into the light. Be certain there is no emotional abuse. In the tenth position: While for some this gate will cause but a small ripple in their personal relationships or their creative pursuits, for others the ripple will be more like a wave, for a few perhaps a tidal wave. But for all, the effects are beneficial.